And not only did she smile for the first time. But she smiled for the FIRST TIME for her big brother, BRIAN!!! I'm so happy for him. This was the perfect scenario - for her to save her first smile for him. He was so excited and has been beaming about it this afternoon. There's really not much I can write about this momentous occasion, so I'll let the photos show the story. I'm so happy that I just happened to be taking pictures of the two of them when it happened. Although I'm sure that was no coincidence. What a spirit lifter this was for me today. You can see that twinkle in her eye. I wish you a smile that comes easy, Hope... for the rest of your life. *** Gavin's Birthday Project update! Brian, Hope and I went to the bank this afternoon and came home with grateful hearts and three checks. The Gift of Life Family House, DuPont Hospital's Child Life Department and the Chester County Intermediate Unit (Gavin's Trust Project) will each receive a check for $1,232.10 thanks to those who donated to Gavin's Birthday Project! I know each of these organizations will put the money to good use. And I was grateful for yet another opportunity to model for Brian the importance of giving to others. At his age, he may not fully grasp the incredible and far reaching effects of his brither's life and death - and the way it has inspired so much good in so many. But I hope one day he will feel overwhelmed as he realizes how much was accomplished and how lives were changed all because of love. Beautiful!! What a blessing he was and continues to be. Thank you for sharing him with us. All I can say is Wow! That video is amazing!!!!! You are a strong person to handle this all the way you have. Never doubt that for a minute. oh, Oh, OH!!! That's what I literally called out. 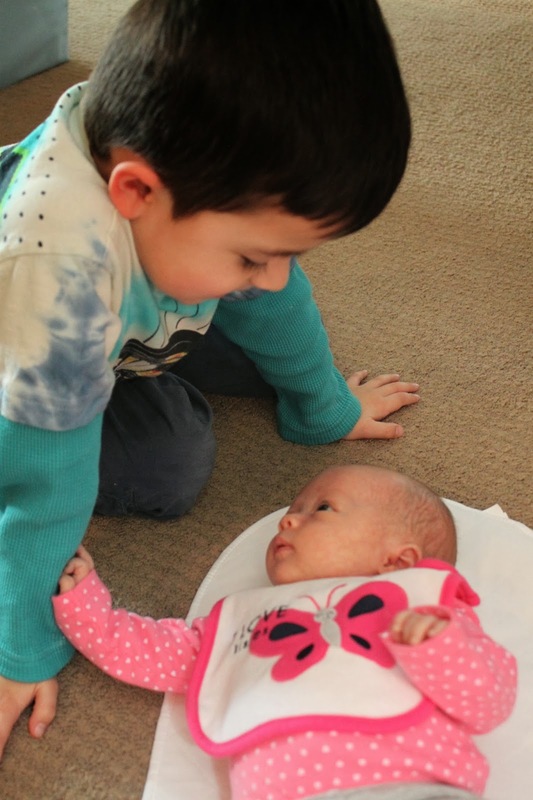 SO precious, and SO wonderful that her first smile was for her amazing big brother. Couldn't have been more perfect. I love how she is reaching out to touch his arm to make sure he is paying attention to her before she smiles at him! So so sweet! 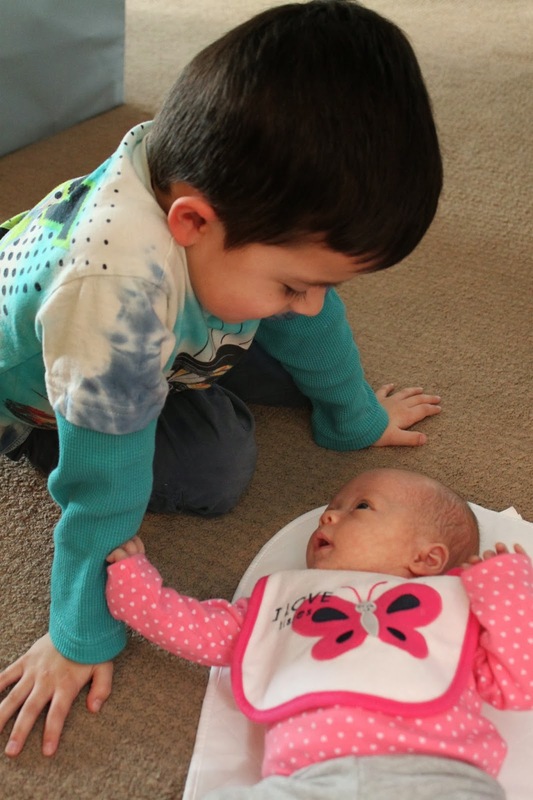 So excited to see Hope smile at her sweet brother, Brian! And crying tears of mixed emotions again, as I watched the video of Gavin. Such joy as I watch the pure love between each and every one of you, and the happiness on Gavin's face as he FEELS the love. And sadness for the loss of his physical presence in this world, and the knowledge that this world needs more GAVINS to show people kindness, gentleness, innocence, and love. But we all know there will never be another like dear Gavin. He remains forever in your hearts (and ours). Thank-you for sharing. Kate, the pictures are so great. The video is painfully beautiful. Thank you for sharing. The video...and the wicked reference...Elphie would be proud of your family. I've watched this video more than once and it never gets old. How proud you must be of all your children. I am totally amazed at how far Gavin had come. Heaven definitely has a special angel. It saddens me Brian doesn't have his best friend here to share the job of being big brother to Hope. I know Brian will do a wonderful job though. I pray they have the relationship Brian and Gavin had. You could definitely see the love they had for each other. What song is used in the video? All of it sooo very precious. Love, love, love the video and those songs. My three year old son caught me watching the video and was captivated by the boys. He asked if we could go to the beach and play with them. When I explained he had died and was with Jesus, he started crying saying "I want to play with him" and "I didn't get to say bye" even though he's never even seen anything about Gavin. I told him about the donation and Gavin saving other kids and he said "Wow...like a superhero!". After the video he asked to "pray" and told Gavin he was sorry they didn't get to play at the beach and to say hi to Jesus and have fun playing with Him. He then asked Jesus to take care of Gavin, finishing with "and thanks for Hope" before going on his way. Even little tykes are deeply moved by Gavin and Brian and your story. Thank you for sharing the love.